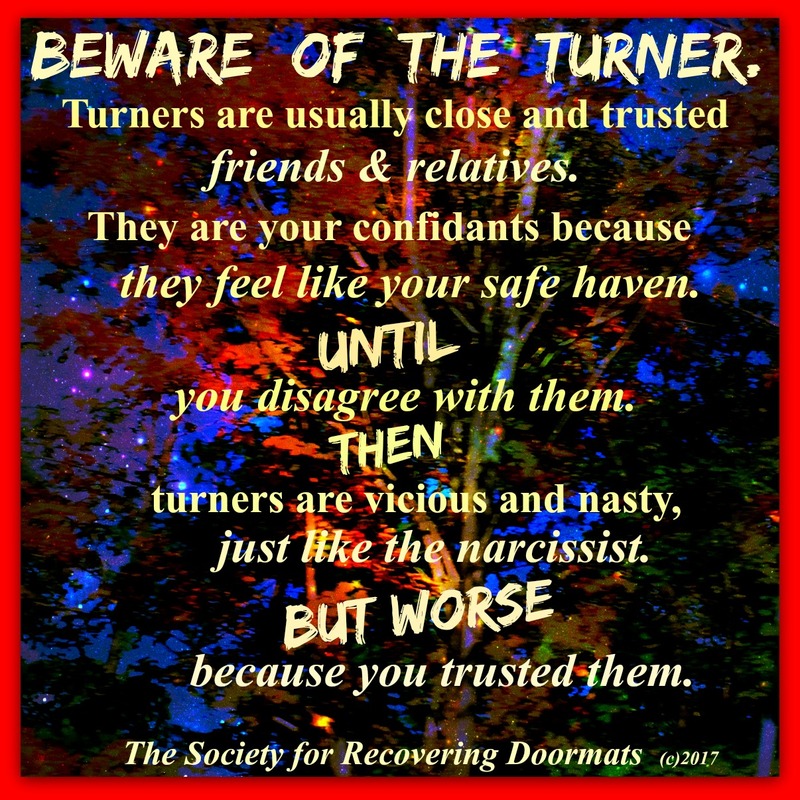 Turners are usually close and trusted friends and relatives. They are our confidants because they feel like a safe haven until disagreeing with them. Then, turners are vicious and nasty, just like the narcissist. But worse because we trusted them and never suspected their toxic side. The main difference between a narcissist and turner (although they are kissing cousins) are the recognizable red flags preceding the narc. The turner doesn’t exhibit warning signals. Their status is only realized after burning us. They are more dangerous than narcs because much energy, love and trust is invested in them. Many times, we excuse away the first attack because we can’t believe our dear one is capable of this hurtful behavior. Once a turner shows you who they are; believe them the first time. They will do it again and again if you allow them the first trespass. Distance yourself emotionally and avoid another turn burn. I am saddened to read about the terrible turn burn your son must be experiencing. I hope he will remember that if he doesn’t let her go he’s in for many more burns from this turner. The scenario you described is classic turner behavior. Thanks, ivytobin. It means a lot for me to hear an encouraging word. Until this happened, I had no idea how very hard it is to watch a child go through divorce. Worse than THE TURNER is THE SNIPER. The Sniper is the ultimate narcissist with delusional feelings of grandeur. They are self promoting liars, so consumed with insecurity and envy, that they will go to any lengths to make themself relevent. The Sniper is so starved for attention, that they will shoot to kill, anyone that gets in their way of ‘ their ’15 minutes of being not so famous, even their best friend. Watch out for Snipers, ( often camouflaged as advice givers), they are calculating, devious, snakes, that will attack when least expected when least expected. Thanks for the advice. I’d never have come up with that search! Thanks. I surfed a bit, but didn’t come up with much. I’ll try BBL.